So after a long post on the brewing process, this is going to be a much shorter post. From the point of the boil after adding the malt through bottling or kegging, the process remains the same whether you are doing all-grain or extract brewing. The first steps change a fair amount, though. Something to spread out the flow of water – we fit an upside-down colander into ours. The first step, once you’ve gotten your kit and the grains, is to heat up the water to 170 degrees. You will be steeping your grains in this for an hour or more. Normally at 170 degrees, you would leach out undesirable flavors into your beer, but at this point in the process, you’ll add the water to 12-14 pounds of grains and into your mash tun — this will cause the temp to drop. Your target temp is 156 degrees Fahrenheit — though this is only true if your mash tun is made from a cooler. I would recommend using a cooler over the stovetop for this part of the process, since it allows you to use fewer kettles, and since a cooler will lock in the heat consistently for an hour, as compared to having to regulate the temperature yourself if you do it on the stove top. 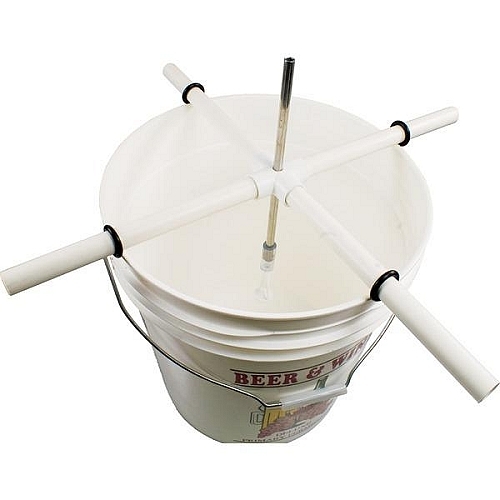 When mashing your grains, first put in the water, then add the grains to the mash tun. Stir up the mash tun so that all the grains are wet, and close it up. Every fifteen minutes, open it to stir the grains and check the temp (you should already have a thermometer from the previous instructions). If you find that the temp is dropping too quickly, you can add in more hot water to keep the temperature up. Otherwise, after an hour, you should be able to drain a little of the liquid off the bottom and taste it. It should be sweet to the taste; this means that you’ve gotten most of the sugars out of the grains. If you don’t think it tastes sweet enough, close it back up again and let it sit for another 15 minutes. 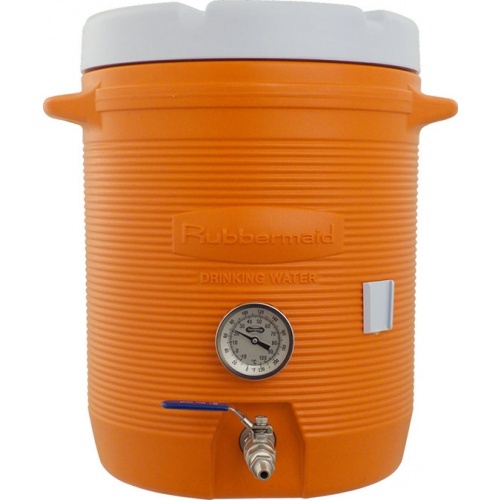 During this hour, you should be heating more water — basically the amount of water that you want for your brew, so probably 7-8 gallons of water, since some will boil off later and you won’t take all of it back out of the grains. This water is also heated to 170 degrees. The next step after the mash is the sparge. Sparging is how you collect any of the extra sugars that are still in the grains. The first thing you’ll do at this point will be to drain off a little of the current liquid in the mash, enough until the liquid coming out has cleared up (this is one area that I messed up the first few times — by “cleared up,” I mean that there isn’t any sediment coming through anymore, not that the liquid has become clear like water). Take this liquid and slowly pour it through your upside-down colander (or whatever you are using to disperse the water); this allow all the grains to filter out any of the sediment that was in the liquid. Taking the water that you’ve heated, start slowly draining the water from the mash and adding to the top of the mash so that the top of the grains are always covered. By doing this slowly, you are draining out the water that has been sitting there first, and allowing the added water to pick up remaining sugars that have stuck to the grains. The recommended length of time this should take is between 30 and 90 minutes, and it appears that, in general, the slower the better. Now that you’ve done this, you have the equivalent of your boil ready to go with the malt extract incorporated into it, and the rest of the steps are the same as extract brewing. Why would you want to switch to this type of brewing? Because all malt extracts are the same recipe, you can create different-tasting malts or tweak the flavors by using the grains yourself. How hard is this compared to extract brewing? It is definitely harder. I had a couple of batches that went bad or that we didn’t get all of the sugars out of. A lot of brew supply stores will have classes that you can take (often for free) about brewing, and that is a good way to learn, or you could just ask the people working at the store, and most will be able and glad to help you. Is the extra time worth it? I would say yes — it might add more time to the process and require more equipment, but I think that it is; it gives you control over another aspect of the beer. I’ll actually be doing an article on that in the future (a while from now), and I’ll talk about what can influence the taste of your beer. So that has been a quick overview of brewing and beer. There will be more coming in the future, when I’ll give a more in-depth look into creating a recipe, how water and yeast influence taste, and even more things about beer than you’ve ever wanted to know!